The second half of placement was a real challenge for me. I really struggled in a way I didn't think I would and it made me question whether I could actually be an OT. But through the busyness and stressful times, I really held onto the client focused times and hopefully managed to improve my practice with the help of my educators. Thankfully I managed to pass the placement and do feel it helped my grow as a practitioner along the way, which is really what placement is all about. It did however give me plenty of opportunities to reflect on the impact my own confidence in my ability can in turn effect how well I practice. I made me question my belief in my clinical reasoning and really search for ways I could be sure I was guiding my thinking in an occupational and clinically safe way. In the latter part of my placement I started to use PEOP to guide my assessment and intervention planning which really helped build my confidence in my clinical reasoning particularly when need to feedback in team handovers and to my educators. It made me realise how important the theoretical base of the profession can aid how I practice even when the trust/organisation doesn't use a particular model. I felt the nature of an acute setting can create limits on the scope of services OTs provide as the pressure to discharge patients and create a more effective patient flow (Crennen and MacRae, 2010). Does this therefore make it difficult to utlise a specific model in its standardised form to guide our service. Maclean et al. (2012) research lit review highlighted that within previous research acute OTs were more likely to use CMOP or other patient conceptualisation models to guide their reflections on the service they provide rather than their real time assessment. Its not surprising then that I found the PEO model easier to guide my understanding of the patient in line with the services I could provide within an acute service with its historical connection with the biomechanical frame of reference (Law et al, 1996) used within a hospital setting. I found that this model particularly helped me relate to the functional occupational performance issues I was seeing in my patients, to the medical symptoms of their conditions and then in turn how that impacted them as an occupational being within the service provision. I also found that this model helped me link how the environment (person-environment) both with the hospital and the discharge environment can have a direct impact on how the patients could engage in the essential activities of daily living, for example with a patient who had been limited to bed space due to O2 dependency had allowed for more deconditioning as patient was using commode near bed space rather than walking to ward toilet. But also how this may have impacted on their mood and in turn thier engagement in personal care tasks on the ward. The model in theory should enable the therapist to delve deeper into the impacts the environmental aspects of a individuals life impact on how they cope and the meaning they have in the things they do by considering the social and cultural environments as well as the physical environment, for example the social support available within a patient life through a close and involved family. This in turn had impacted on the patients understanding on how they could manage when at home and their willingness to consider downstairs living on discharge, as they felt that the support the family could provide would mean that the living room could be made homely and inviting for her to reside in. This was similar to findings of Maclean et al (2012) qualitative research into the use of PEOP in acute settings. As a student occupational therapist, transitioning to a qualified OT, an understanding of a suitable model to guide my clinical reasoning and therapy planning will enable me to work in a client centred way. 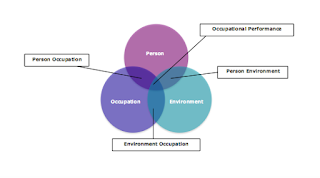 Within acute physical settings, the PEOP model works well for me as it allows my occupational focus to work in conjunction with both the medical model and a social model bringing together the aspects of a individuals occupational performance through daily occupations and discharge planning. Crennan, M., & MacRae, A. (2010). Occupational therapy discharge assessment of elderly patients from acute care hospitals. Physical & Occupational Therapy in Geriatrics, 28(1), 33-43. 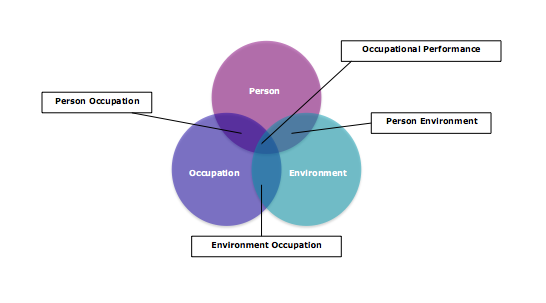 Law M, Cooper BA, Strong S, Stewart D, Rigby P, Letts L (1996) The Person- Environment-Occupation Model: a transactive approach to occupational performance. Canadian Journal of Occupational Therapy, 63(1), 9-23. Maclean F, Carin-Levy G,Hunter H, Malcolmson L, Locke E (2012) The usefulness of the Person-Environment-Occupation Model in an acute physical health care setting. British Journal of Occupational Therapy, 75(12), 555-562. Parker, D.M., 2013. An exploration of client-centred practice in occupational therapy: Perspectives and impact (Doctoral dissertation, University of Birmingham). Turpin MJ, Iwama MK (2011) Using occupational therapy models in practice: a field guide. Edinburgh: Churchill Livingstone.